My mom has been making Tradewinds Muffins for years. I have had the recipe in my recipe box forever but usually I just wait it out till she makes some and shares with me. Recently I had all the ingredients in my house and I felt like baking so I tried it out. These muffins are heavenly. If you start your day off with one of these, no one can do you any harm. They have pineapple and almonds and cream cheese and sour cream, all of which make the batter moist, delicious and full of pieces of joy. In my mom’s version she saves 1 tablespoon of the pineapple juice to use for a glaze, which only makes them better, because a pineapple glaze makes this like dessert instead of breakfast. Muffin tops are not usually a good thing when they are spilling over someones jeans, but the muffin tops on these babies will make you sing hallelujah! In a bowl, beat the cream cheese, sugar, and vanilla together until smooth. Blend in the egg. Sift the flour, baking soda, and salt together in a separate bowl and add to the sugar-egg mixture alternately with the sour cream. Fold in the drained pineapple. Sprinkle the nuts in the bottoms of greased or paper-lined muffin tins and fill three-fourths full with batter. Bake in a preheated 350 degree oven for 25 to 30 minutes. Glaze: combine 1T soft butter, 1C sifted confectionary sugar and 1T pineapple syrup, spoon over muffins when cool. I have a busy weekend so this will be a quick post. I have been clean from Nutella for over a week now. I know I should get a pin or a chip or something right? Does it count as being clean if I have eaten, cupcakes, fudge pudding cake, and a milky way instead? I guess not… anyhow I wanted to share a recipe for killer cookies. Giada my favorite (and always way too happy) chef has made some great Nutella recipes. My two favorites are her Nutella Cookies and her Nutella Gelato. The Nutella cookies are the same idea as making peanut butter cookies but waaaay better! She call’s them Chocolate Hazelnut Biscotti to sound fancy and Italian I guess, but ask my mom, Biscotti is not usually round and is made to be more like a hard crisp cookie.. This is just a recipe for a regular round cookie that is quite soft, so don’t let the biscotti title mislead you. 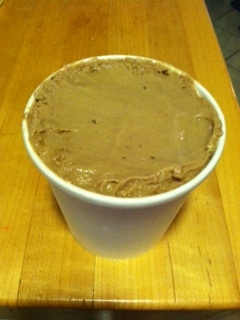 The Nutella Gelato sounds tricky but if you have an ice cream maker (thanks to my awesome MIL, I do!) then that is half the work. I tell ya I have not had authentic gelato that good since Sicily, so try making it at home if you wish! I am hoping eating the Nutella in a recipe (most of it cooks out like wine maybe?) is not as bad as straight from the jar, so that makes it ok right? Sometimes I get lazy so I make breakfast for dinner. Nothing is easier than making up some quick pancakes and it makes the kiddos happy too. I still have my favorite pancake recipe from Home Ec class in 9th grade! This time I wanted to make something else so I went to one of my favorite recipes, Pecan Waffles, courtesy of Emeril. I have never made his flavored syrup he includes in this recipe and my regular syrup works fine. These waffles are great when you have company on a Sunday morning. They taste amazing and will impress your guests. Tonight my only guests are my kids and even my picky older one will eat these. The egg white part can be a bit of a pain but overall it is worth it. Don’t be surprised if when you add your melted butter it clumps up a bit in the cold milk, that is ok, it will melt when you make the waffles. Also make sure to just fold in the egg whites, don’t over mix them. The egg whites will add a nice fluffy quality to the waffles and the ground pecans will add a sweet yummy flavor. I also have another great breakfast recipe I will share, for Banana Stuffed French Toast. I got this off of my Sunmaid Raisin bread bag and it is another crowd pleaser. It is very filling so I suggest only making it for a larger group, most people can’t stomach more than 1/8 of a pan serving. It is sooo yummy to use raisin bread and bananas and cheesecake like filling and it creates a really pretty presentation too! So if you want to switch it up from the typical breakfast for dinner or need a dish for a fancy brunch, try either of these dishes. By the way I don’t know what I enjoy more, writing this blog or taking photos of my food, I know, I am loco! this ain’t your momma’s chicken soup! I have been dying to try this recipe ever since I saw it in my awesome food network magazine (if you have never checked this mag out you should it has the best recipes, is very user friendly and is cheap to subscribe). It is called chicken and egg soup with pastina. Pastina is basically a type of small pearl shaped pasta, but any small pasta will do, I used small star pasta. The best part of this soup is the eggs you add in at the end, they make the soup incredibly creamy and delicious. 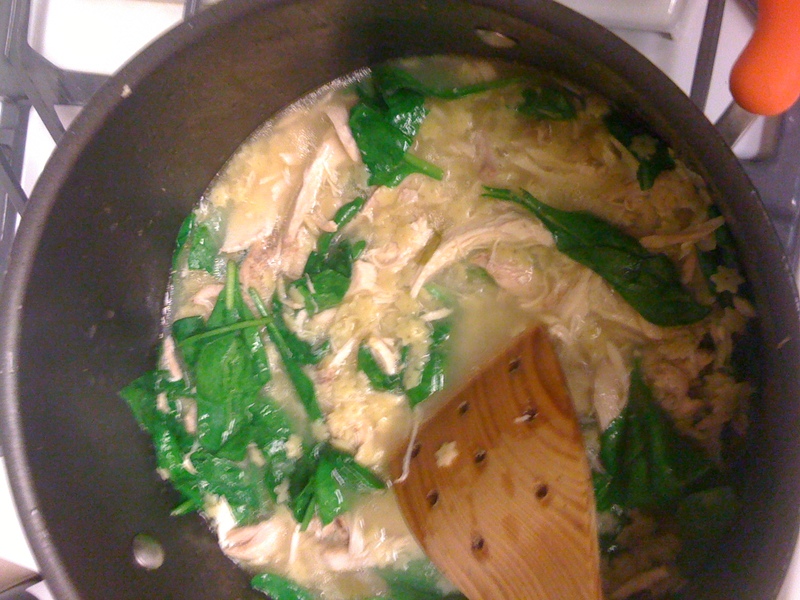 It is almost like an egg drop soup. I did not have feta cheese so I used pecorino romano (my favorite, if it it does not say pecorino then it is not authentic or sheep’s milk). I think any favorite cheese would do or no cheese if that is what floats your boat. The spinach added a nice touch. I actually made my own chicken stock by boiling a chicken in 7 cups of water and using parsley, celery, onion, salt and pepper. I needed the chicken stock for another recipe, but you can also use a good ol’ carton of Swanson too. If you are tired of your same old chicken soup and are looking for something hearty to warm you up this time of year, give this easy recipe a try. Your momma won’t mind, especially if you offer her a bowl! 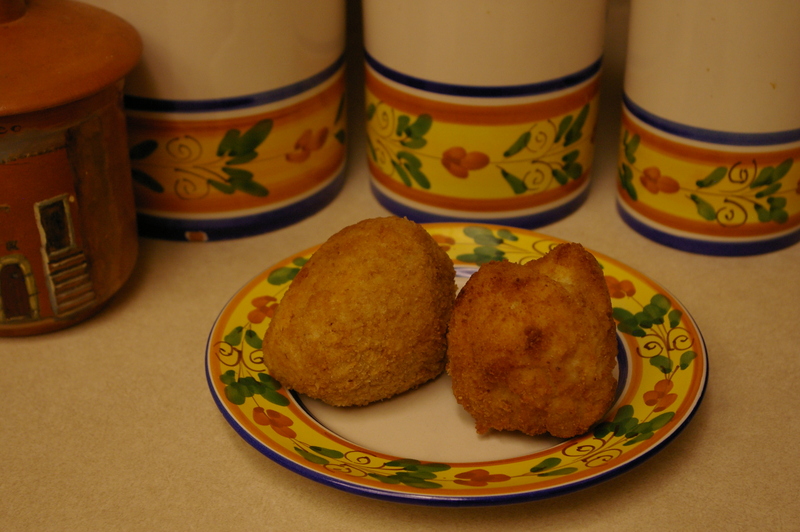 Tonight I am attempting Arancini with my DW (deployment wife), if it is successful I will post the recipe and pics! You Shoulda Put a Ring on It! Made this killer coffeecake for my soul sista in Folsom over the holidays. 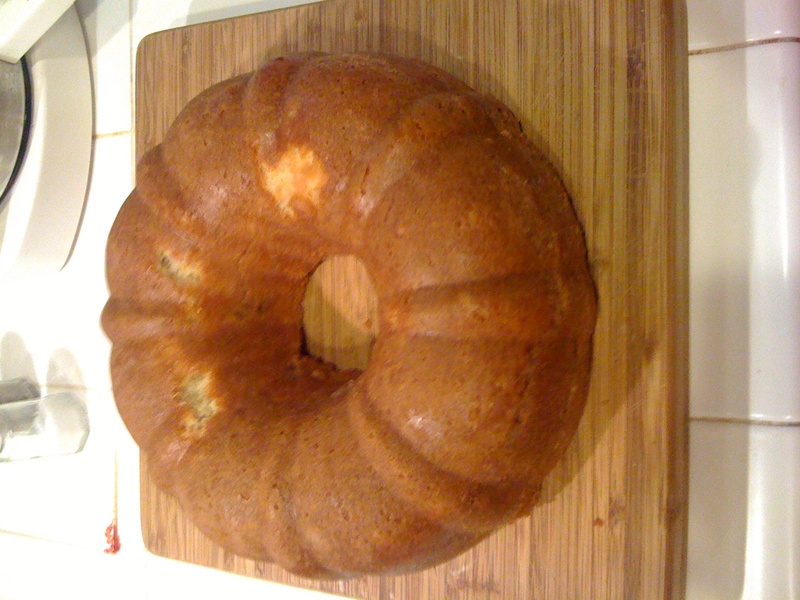 It is called a Sour Cream Coffee Cake and something about the sour cream really makes it moist and delicious. I guess the stick and a half of butter helps too! I know you are not surprised that it is not diet, my baking is never light. But I find if I make it for company it gets eaten faster so I don’t eat the whole cake myself. It is from Ina Garten, the Barefoot Contessa, filmed in her small “cabin” in the Hamptons. Seriously, this lady knows how to make some tasty dishes. Even though she is a bit snooty to some, I really enjoy her. The maple syrup glaze really makes a nice addition at the end, I mean who can turn down frosting? Because of a genetic predisposition I have GFD (genetic frosting disorder) and I cannot control myself when frosting is involved (thanks mom!). You are currently browsing the What Tara's Cookin' blog archives for January, 2011.